A good music supervisor is in a powerful position - the right music cue can help catapult a film or television show to greatness, and the songwriter or performer to acclaim. 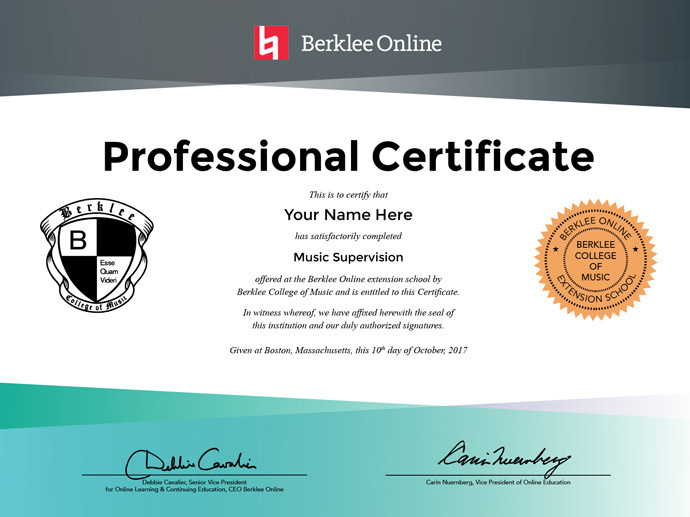 Berklee Online's Professional Certificate in Music Supervision gives you the skills you need to excel in the field—how to work with songwriters, producers, artists, publishers, directors, and performance rights organizations; how to know whether a given piece of music would fit a mood or scene; and how to navigate the statutes that govern who gets paid for what when a piece of music is licensed for use in film or TV. This 5-course program explores the ins and outs of legal issues, copyright, music supervision, publishing, and songwriting so that you will be able to function effectively on either side of a licensing transaction—from the position of an artist or as a music business professional.